Have you ever planned out a single photo? I mean, really planned out single photo? If you are like most people, you take snapshots of your friends and family and interesting things you see as you travel, but you never really planned a single shot. The most satisfying pictures that I have ever taken are some that I literally took hours, if not days, to research, to get just the perfect picture. They aren’t my BEST photos that I have ever taken, but they were very satisfying because in the end, I knew my research paid off and I got the shot that I envisioned. Every day I drive over some railroad tracks near my house. One night when I was returning home from work, I noticed that the sun was about to set a few degrees to the left of the track. I wondered if the sun would ever set “right on” the track. I wondered if I had just missed it, perhaps the week before. I couldn’t figure out if the sun was moving progressively to the right or to the left each night. How would I calculate all these things? WARNING–This paragraph is a little technical with respect to astronomical terms, but I will try to keep it simple. If you want to skip it, I won’t blame you. When I got home, the first thing I did was open google earth and find the railroad in my neighborhood. Using the “Measure” tool, I calculated the angle of the railroad track. It happened to be 260 degrees west, or 80 degrees east. I was looking to shoot my picture at sunset, so I was interested in the westerly direction. I then went to timeanddate.com, entered in my location (Chesapeake, Virginia) and found out that the sun would set at the azimuth of 260 degrees on Feb 25th and 26th. Furthermore, the numbers were increasing each day, so I knew that I did not miss my shot. Of course, I could always wait until next year (or more accurately, on October 14th when the sun comes back from the other direction, but I was happy that I did not have to wait). You still with me? Good. So, now that I calculated the dates I could take my shot (Feb 25th & 26th), I was ready to go. If you remember, February 25th was a rainy day. I was not able to go out and shoot that day. I did however, get out the next day. You can see here the shot I got. 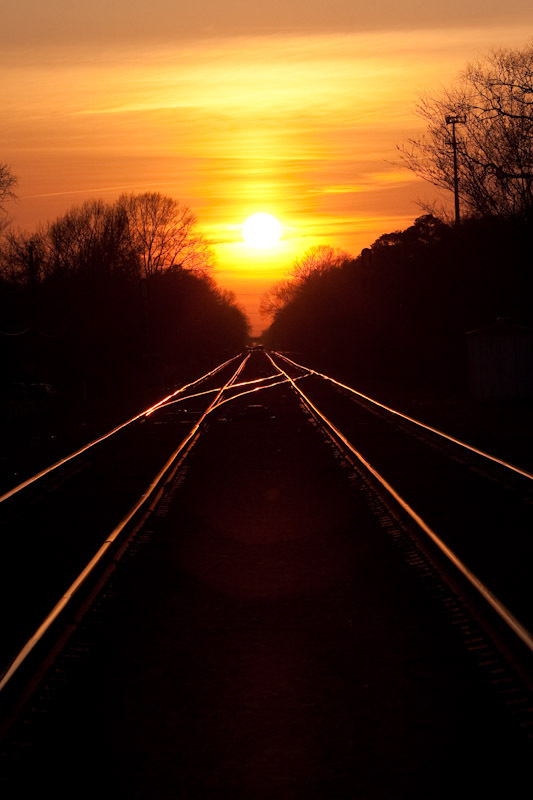 And if you look carefully, you will see that the sun is a little to the right of the tracks. I think February 25th would have been a better day. Also, another option is to shoot the sun rising on the track. The reciprocal of 260 degrees is 80 degrees. It turns out that the sun does rise at that azimuth on April 7th and 8th, and September 2, 3 and 4. The punchline here is, if you want to be a master of photography, you will have to also be a master of your subject. If you want to get great horse racing, or food, or portrait pictures that don’t look like the same pictures that every other person with a camera gets, you have to know every in and out, up and down of the subject, and how it correlates to lighting and photography. Few people in this hobby just have the knack and can just point their camera at something and have it spit out money. It doesn’t work that way. It takes time and effort to really get to know your subject and how to best photograph that subject.